Very cozy and easy to contact. They came to receive us a new and clean apartment. all! The host was very kind. The owner Eleni, always smiling. Blanka (Eleni's daughter-in-law) is Polish, so we had no problems to talk about everything. She told us where to go and what to do in Crete. rooms very clean. often changed towels and bed linen. very good location and great internet! I recommend it to everyone! Perfect location for Beach, bars & restaurants but far enough away for good nights sleep, Bed very comfortable & room quite spacious with plenty wardrobe space, there was a kettle & full size fridge.Vert peaceful area & you get the sun in the afternoon if your at back of apartment. Lovely owners who are very friendly, we would certainly stay here again. Host and his family were extremely accommodating and friendly- picked up at port and dropped to airport. Rooms were beautiful and great view, and value for the price. Would highly recommend! Close to beach great location :) Very clean , everything you would for a apartment. Chilled out place loved it. The best hosts you could wish for, friendly, helpful and informative.. Very clean apartment, comfortable bed, full size fridge with a working ice making compartment! 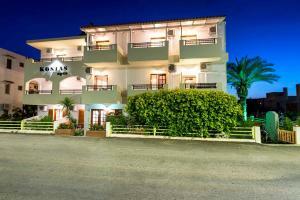 Short walk to beach, supermarkets and fabulous tavernas. 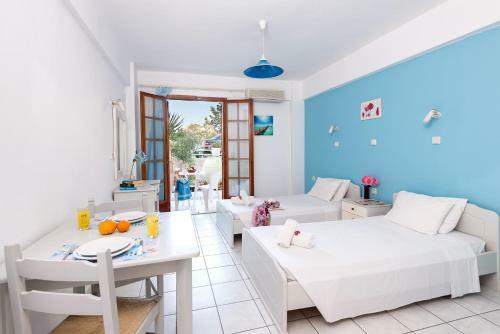 Near to the sandy beaches, bus station and the Kostas Apartments is located in the center of Stalis. And the family is very helpful and communicative. 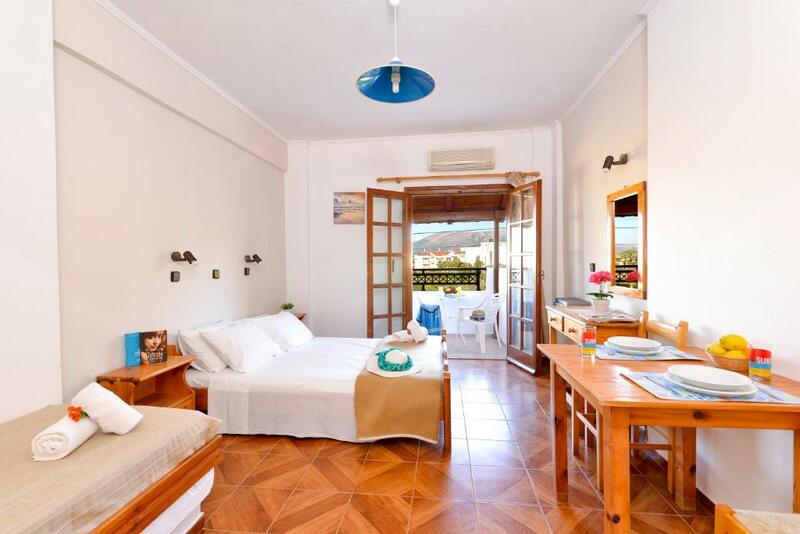 The price for the studio is very competitive in the high season in one of the recommended cities on Crete! 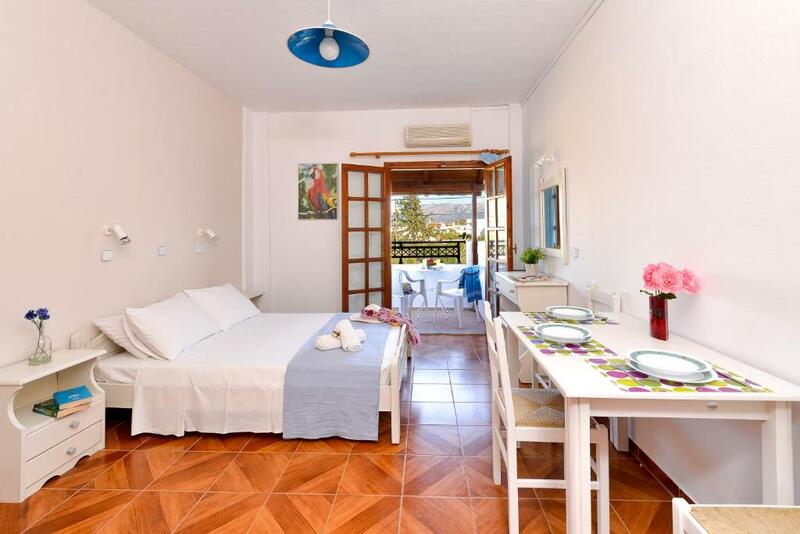 Typical, slightly old fashioned Greek rooms in a great location up a side street minutes from everything. Spotlessly clean, well equipped, and very friendly helpful owners. There is a safe in the room that you can hire for 3 euro's per day 18 euro's for the week, also aircon is 6 euro's per day 40 for the week. We only stopped at Kostas the first and last nights of our 7 day break but the owners were accommodating in letting us keep the room on a little later on the last night for a small charge. We would choose these rooms again. 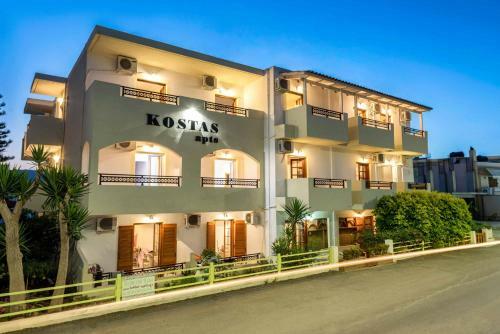 Lock in a great price for Kostas Apartments – rated 8.7 by recent guests! One of our best sellers in Stalís! 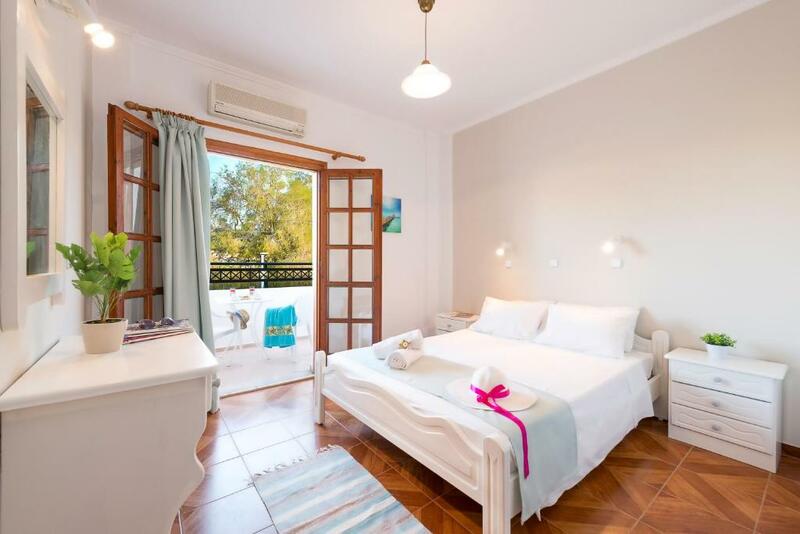 Featuring air conditioning, Kostas Apartments offers pet-friendly accommodations in Stalida. Heraklio Town is 17 mi away. Free WiFi is offered in public areas . All units include a kitchenette fitted with a refrigerator and stovetop. Every unit is equipped with a private bathroom with a bath or shower. Towels and bed linen are featured. Air conditioning is available at a surcharge. Hersonissos is 3.1 mi from Kostas Apartments. The nearest airport is Heraklion International Airport, 15 mi from the property. 뀐 Located in the top-rated area in Stalís, this property has an excellent location score of 9.1! 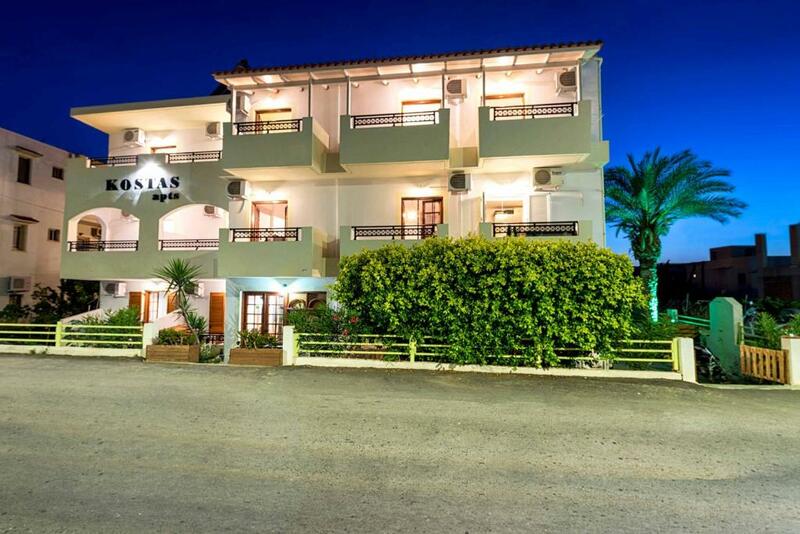 When would you like to stay at Kostas Apartments? This studio has a kitchenette and kitchenware. Air conditioning and a safety deposit box are available at a surcharge. This studio features a balcony and electric kettle. Air conditioning is available at a surcharge. This apartment features a kitchenette, stovetop and tile/marble floor. KOSTAS STUDIOS IS IN THE CENTER OF STALIS. KOSTAS STUDIOS IS A FAMILY RUN COMPLEX WHICH OFFERS ONE ROOM STUDIOS FOR TWO AND ONE ROOM STUDIOS FOR THREE PERSONS. ACCOMMODATION IS SELF- CATERED. EACH STUDIO offers comforts and friendly atmosphere. KOSTAS STUDIOS IS IN THE CENTER OF STALIS. STALIS IS LOCATED BETWEEN TWO BEAUTIFUL CITYS, AGIOS NICOLAOS (WHICH IS WORTH TO VISIT) AND HERAKLION (THE CAPITAL OF CRETE). IT IS 33 KM FROM NATIONAL AIRPORT AND 34 KM FROM PORT IN HERAKLION. STALIS IS CALMER VERSION THEN THE NEIGHBOURING RESORTS OF MALIA AND HERSONISSOS, WHICH ARE KNOWN FOR THEIR WILD NIGHTLIFE. STALIS IS A PERFECT CHOICE FOR FAMILIES AND COUPLES, WHO WANT TO SPEND QUIT AND RELAXING HOLIDAYS. FOR THOSE WHO ARE INTERESTED IN VISITING AND EXPLORING, LOCATION OF STALIS MAKES IT AN EXCELLENT BASE. IT IS A CENTRAL POINT FOR YOUR TOURS TO ARCHEOLOGICAL AREAS, TRADICIONAL VILLAGES AND OTHER INTERESTING DESTINATIONS THAT ARE NEARLY. House Rules Kostas Apartments takes special requests – add in the next step! Kostas Apartments accepts these cards and reserves the right to temporarily hold an amount prior to arrival. Please note that air conditioning is available upon request and at an extra charge, while a safety deposit box can also be provided at an extra charge. the noise from the traffic was very loud and constant, but it didnt disturb us so much. No pool but we knew that before we went,so not disappointed. Small shower for a larger person. 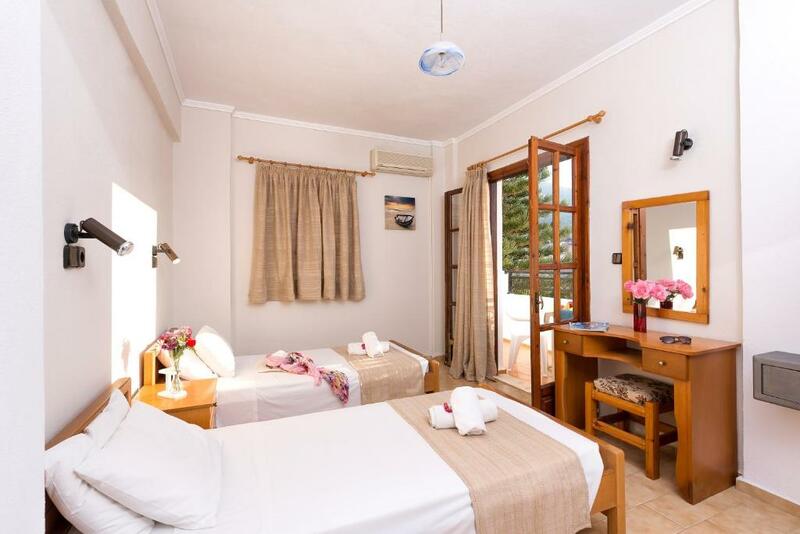 Spacious room, dryer on the balcony was very useful, the beach and the shops are located very close. Nice flowers in the garden. Lovely owners. the lady host was a little surprised when we arrived as though she didn't know about us... there was no hot water in the morning (until around 10 o'clock) the beds were not so comfortable we stayed only one night, but the room should have been provided with soap!